You can vote for one photo per category. Voting deadline is Tuesday 28 March 2017 at 21:00 GMT. The photographers of the best photo in each category will win 100 Euros towards travel to a conference of their choice. The winners will be announced after the voting deadline. 1.1. The competition is open only to APECS International members, if you’re still not a member please join before submitting any picture. 1.2. Pictures that have won prizes in prior competitions, or have been used for commercial purposes will not be eligible. 2.2. The picture has to feature people, at least one Homo sapiens sapiens and to fit in one of the three categories: 1- PolarPeople in action; 2- PolarPeople at home; 3- PolarPeople & wildlife. 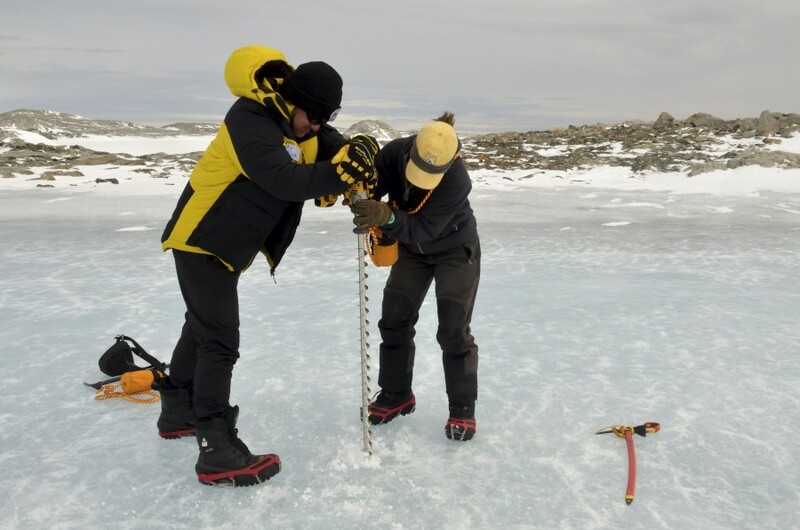 PolarPeople in action includes conducting field work or doing activities, PolarPeople at home should include a resident of the poles, and PolarPeople & wildlife must include a person with either polar flora or fauna. 2.4. Each participant can submit up to two (2) pictures. 2.5. Pictures has to be in JPEG format and without any watermark that will identify the photographer. 2.6. Digital manipulation that distorts the reality of the images will not be allowed. Only basic enhancements such as sharpening, contrast adjustment, or simple cropping will be allowed. 2.8. The submission deadline is 22th of March. 2.9. The organization reserves the right to reject images with incomplete details or that doesn’t respect the theme of the competition. 3.1. Each Image submitted must be original and unpublished for commercial purposes. 3.2. The participant shall retain the copyright to the picture entered for the competition. 3.3. By submitting a picture for the competition, the participant will be regarded as having accepted and agreed to be bound by the rules and regulations of the competition and granted the organiser, APECS, royalty-free permissions to use the picture(s) for promotional or educational purposes (e.g. website, flyers, postcards). APECS will credit the author for any use of the pictures. 3.4. People featured in the picture must also accept and agree with the rules and regulations of this competition. It is the entire responsibility of the participants in the competition to inform and to get the permissions of all the people photographed in the submitted pictures. 4.1. The pictures will be uploaded, by the organiser, to the APECS website, where a public online voting poll will be held, during the polar week (23th to 26th of March 2017). 4.2. The picture with most votes in each category will be the winner. 4.3. Each participant can only win one category. In the case that a participant has the most votes in more than one category, the second participant with most votes will be the winner in one of the categories. 5.1. APECS will award a prize to the first place winner of each category. 5.2. The winner of each category will win a prize of €100 (Hundred euros). These funds can be only used towards travel costs to a polar or cryosphere related conference of your choice within 1 year of the date of the award. 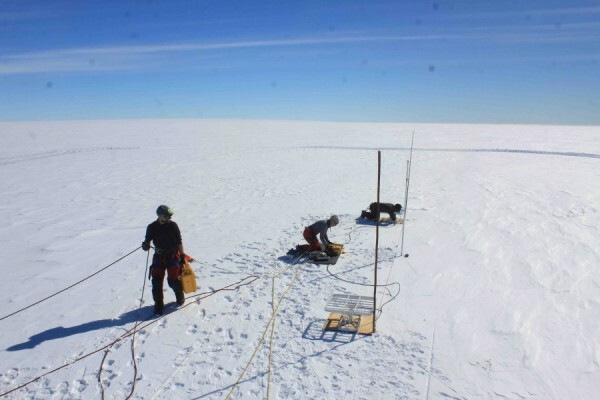 Where and when the photo was take: During summer of 2017 under MADICE project over the Dronning Maud Land, East Antarctica.? Small description: Installation of ApRES, Ice penetrating Radar over the crevasse zone between Ice shelf and Crumple in the background. Each members were roped up singularly and anchored with the Piston Bully, whereas one member on the Piston bully keeping eye on any bad site activity. Description: Scientists of Turkish Antarctic Expedition were studying ecotoxicology and geodesy They were reaching to shore with zodiac boat while some of them taking photos with unique animals. 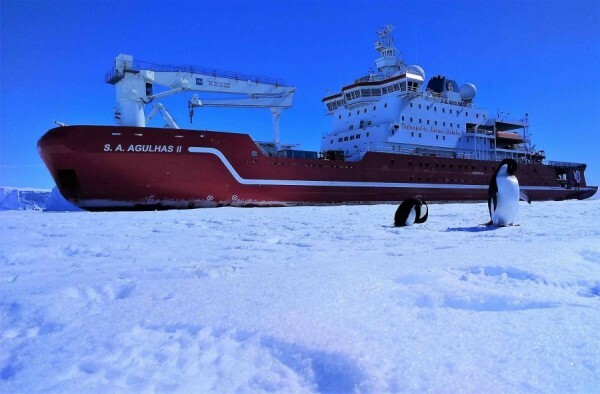 Description: Scientists of Turkish Antarctic Expedition in Research Vessel Australis were passing slowly between icebergs while whales and seals were watching them. 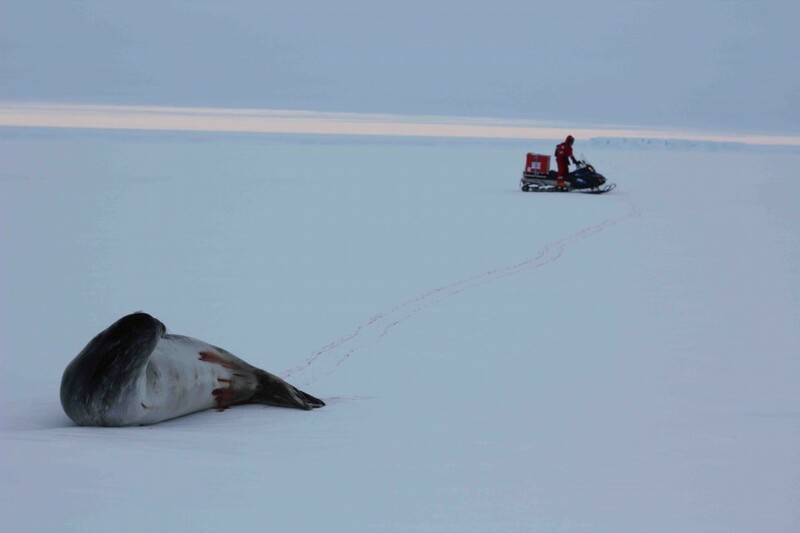 My colleague Thomas Schaefer and I encountered this bleeding Weddell Seal in Austral Spring 2016 during sea ice thickness measurements at Atka Bay close to Neumayer Station. A seal expert told us that the wounds did most probably occur in a fight with an other seal for a breathing hole. 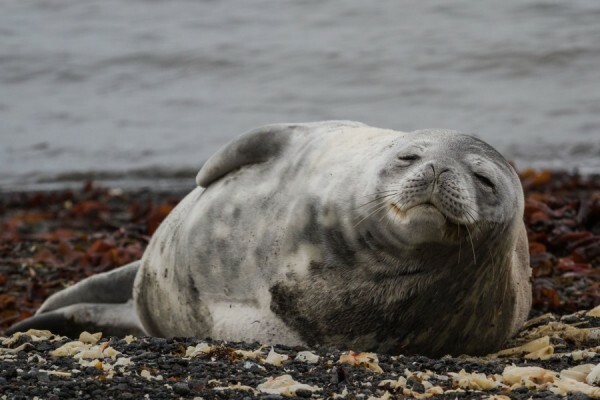 Moreover, Weddel Seals have a much higher amount of blood than humans and can withstand a high blood loss. 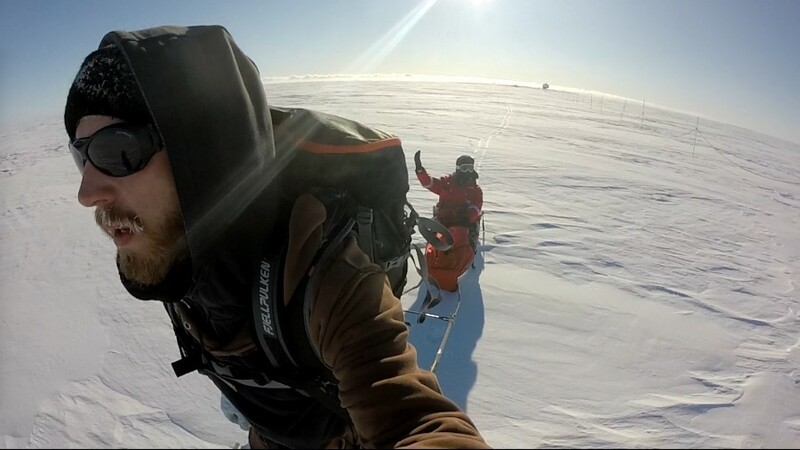 We traced back the blood trail for more than two kilometers, however they disappeared into nothingness. 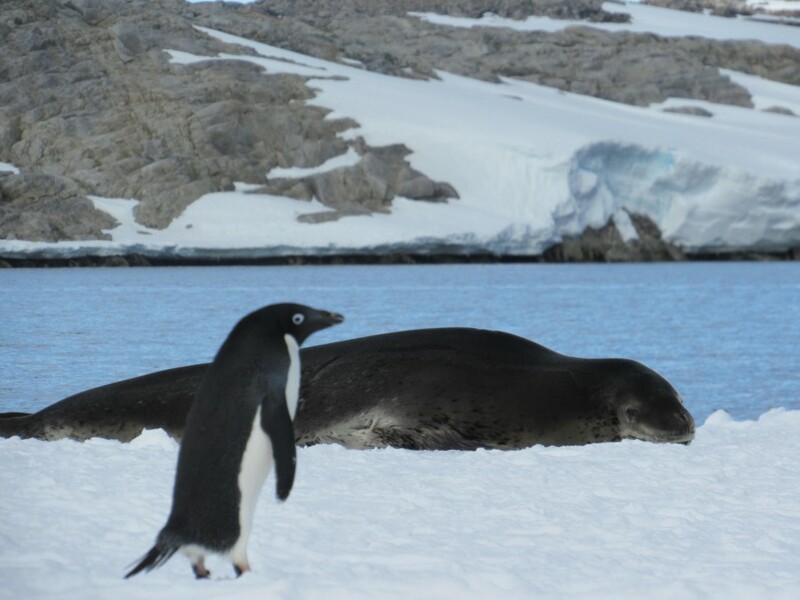 A 14 month wintering in Antarctica can become boring very quickly. 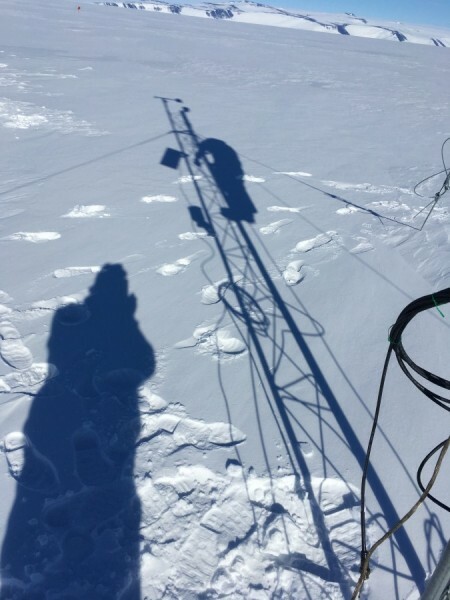 In order to mix it up and push our team spirit, I pulled our colleague to his air chemistry observatory (two times 1.5 kilometer), it was the only day, he didn't have to walk there. The picture was taken on March 23rd 2016, the birthday of my colleague. 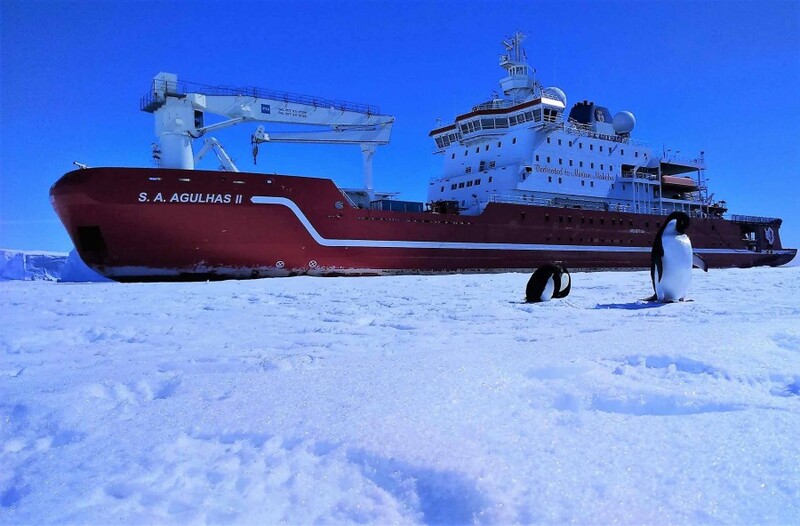 Where and When: Taken on bay ice close to RSA Bukta (0deg Longitude) during the SANAE 56 Annual Relief Voyage from Cape Town to Antarctica within the austral summer Nov 2016 - Feb 2017. 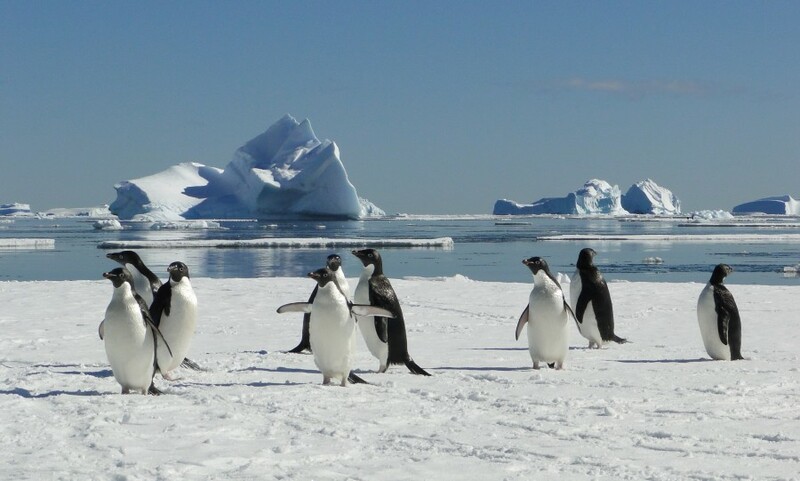 Description: Two curios Adelhie penguins that approached our ship, the SA Agulhas II when we parked on some bay ice for the day surrounded by icebergs. Location: St. Andrews Bay, South Georgia. 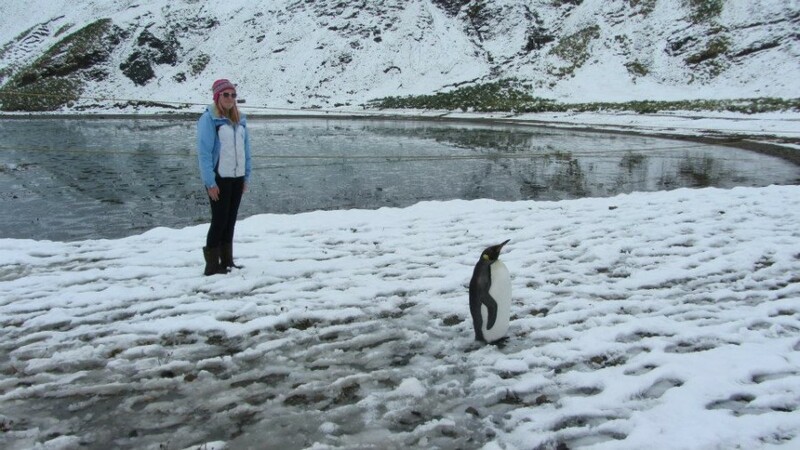 Description: St. Andrews Bay in South Georgia is home to the largest King Penguin's (Aptenodytes patagonicus) colony in the world. 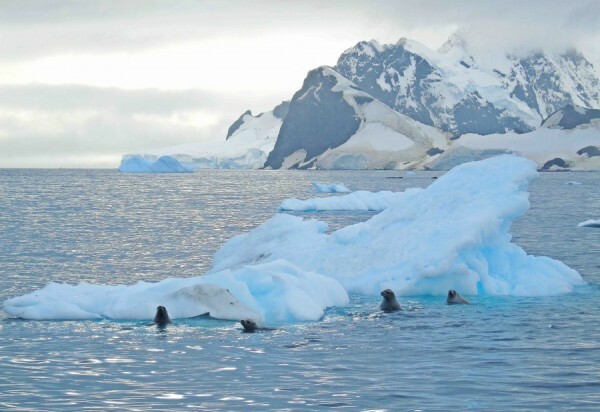 It is estimated that between 100 and 300 thousands penguins breed in this noisy and crowded colony that looks out on the surrounding hills, while great skuas are patrolling from above. Description: St. Andrews Bay in South Georgia is home to the largest King Penguin's (Aptenodytes patagonicus) colony in the world. It is estimated that between 100 and 300 thousands penguins breed in this noisy and crowded colony that looks out on the surrounding hills, while great skuas are patrolling from above. In this picture, researchers are collecting sand cores among the prying eyes of a curious penguin. 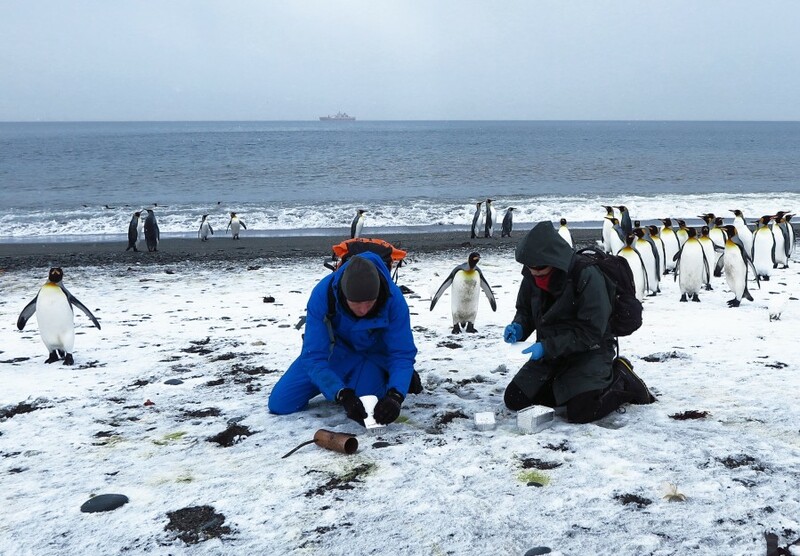 The sand samples will be analysed to study microplastic pollution on Antarctic and sub-antarctic beaches, an activity which was part of a much wider project about plastic pollution around Antarctica, carried out during the Antarctic Circumnavigation Expedition in 2016/2017. The research vessel "Akademik Tryoshnikov" is at anchor in the background. 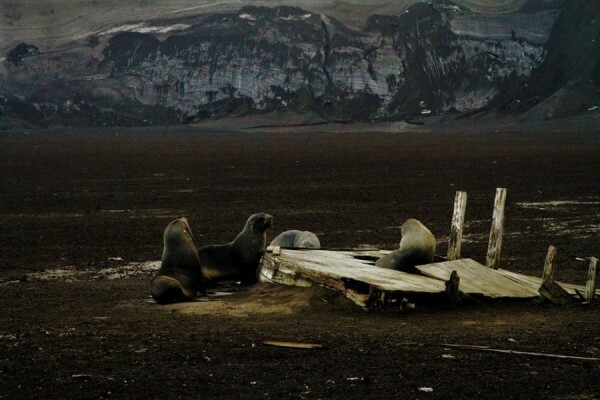 26th January 2013, South Georgia, King Edward Point. Like Human Like Penguin. One of the many King Penguins chilling out on South Georgia. It did not seem at all bothered by my presence but I kept a safe distance to be sure! Description: Curious Adelie penguins on a rare perfect summer's day in the windiest place on Earth. Description: Lobodon carcinophagus Crabeater Seal looking intensely the photographer! 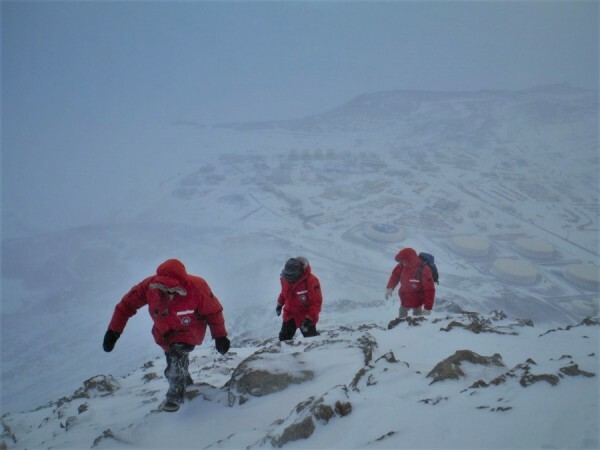 Taken in 2014 of my research team hiking up Observation Hill with McMurdo Station in the background on a stormy spring day. Taken in 2014 at Lake Joyce in the McMurdo Dry Valleys as my research team walks back to camp after a way of drilling of microbial samples in the lake. This photo was taken at Maxwell Bay during January 2017. 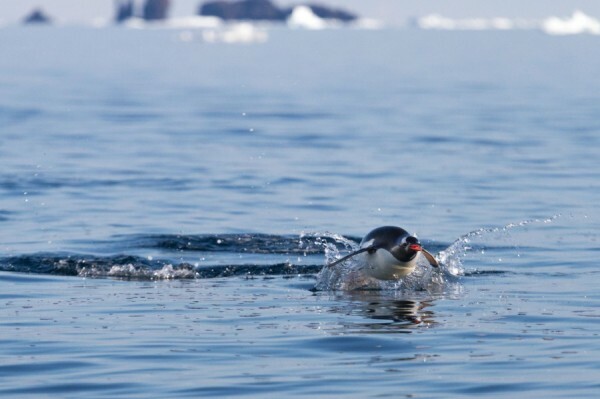 While we vertically deployed an oceanographic instrument at Maxwell Bay, several Gentoo penguins (Pygoscelis papua) were swimming towards our small boat and I was lucky enough to capture the beautiful moment when a penguin was flying out of the water. 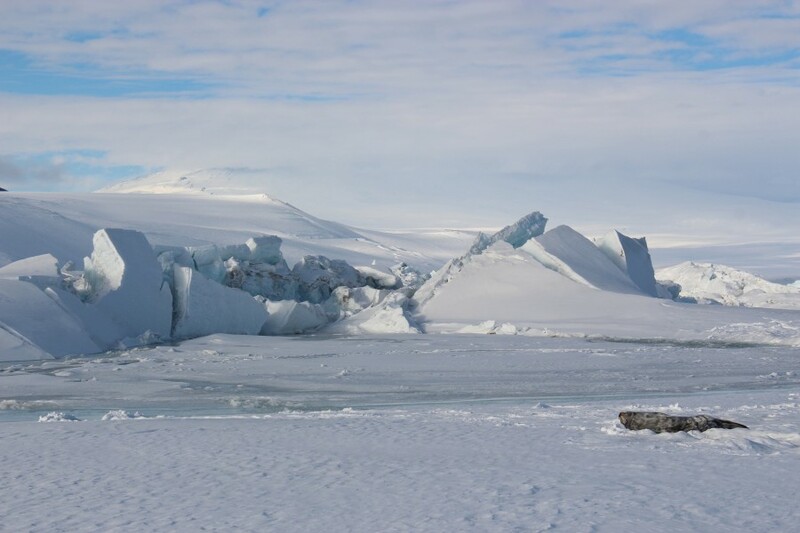 This photo was taken at King George Island during January 2017. 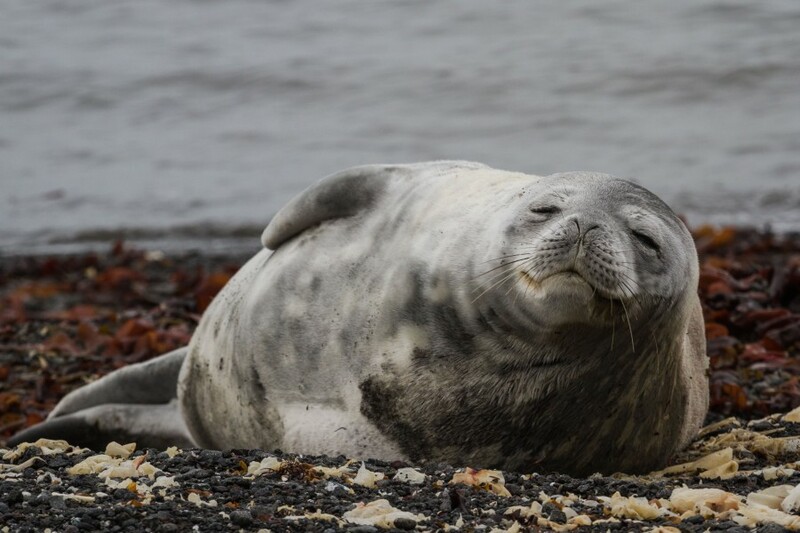 While we were taking a walk, we found this Weddell seal (Leptonychotes weddellii) resting their eyes for a bit at the beach. Looks so cute and tired! 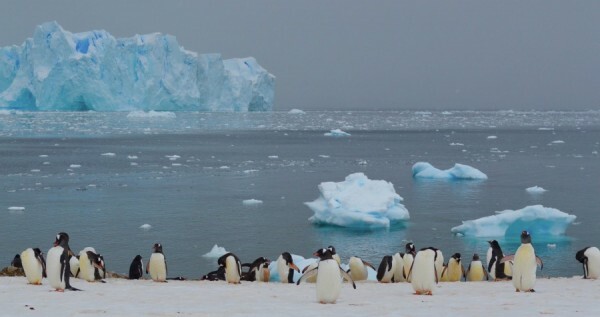 I took the photo on 14th November 2016 when I was at Davis Station, Antarctica. The surprising and uncommon graceful agility of an Adélie penguin as it jumps across a pipe used for station refuelling. 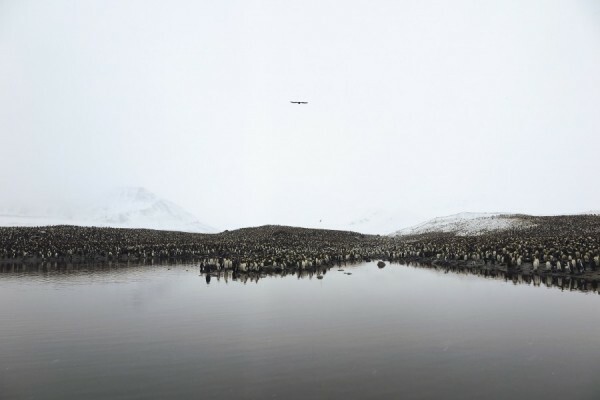 Location/Date: The Antarctic Peninsula, Cuverville Island, 2016/17 Antarctic Season. 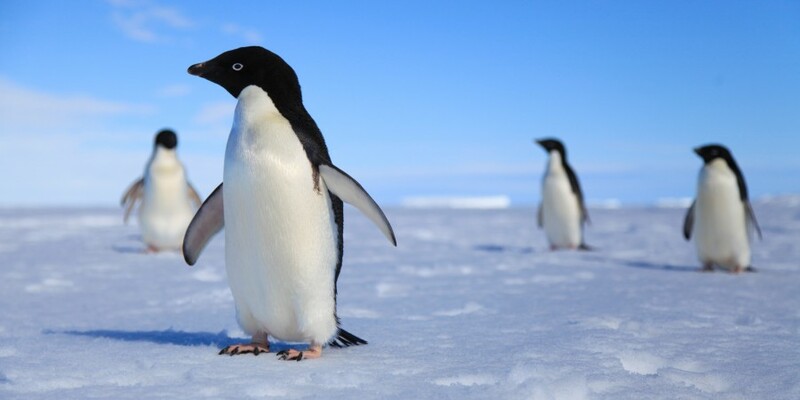 Description: a young male of Emperor Penguin, occasionally met in the vicinity of the Antarctic Peninsula. 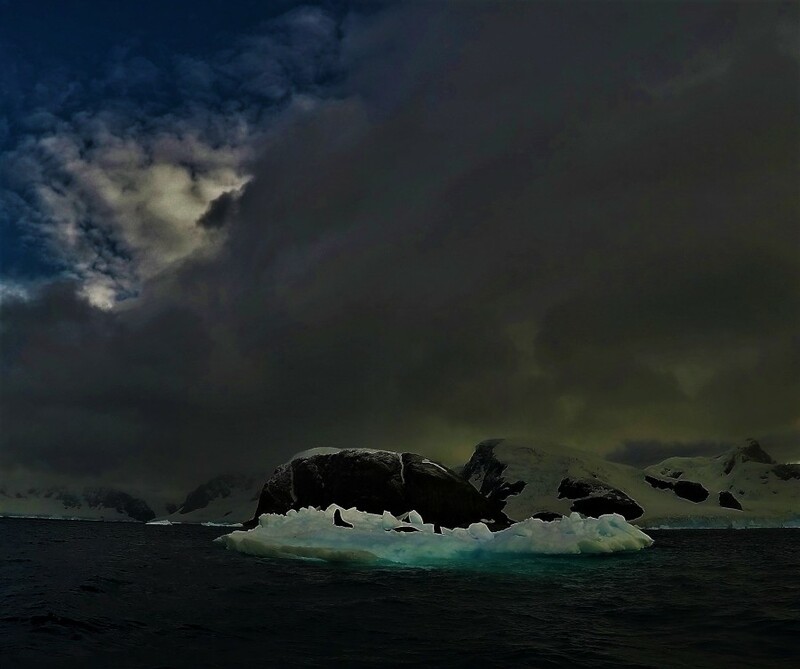 1st of January 2016, Carlini Base (Ex Jubany) - Potter Cove, King George Island, in the South Shetland Islands (Argentina - Antarctica). 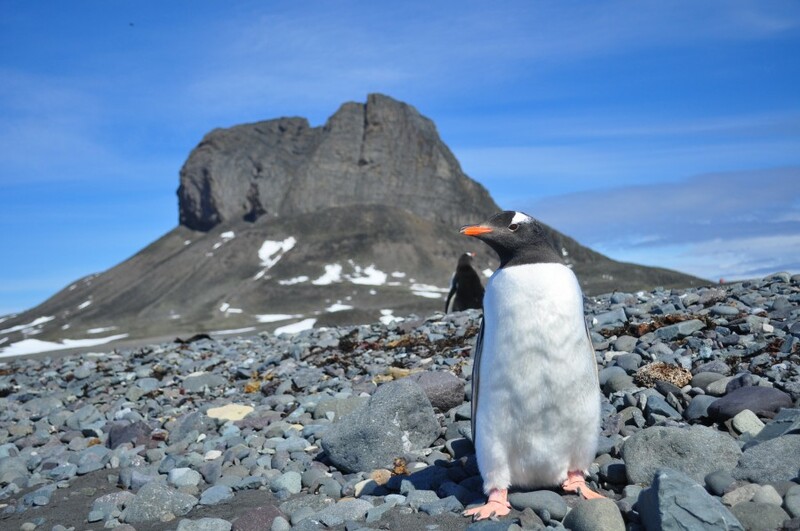 Close encounter with a Gentoo penguin (Pygoscelis papua) to celebrate the first day of the year 2016 in the argentine base Carlini with its emblematic mount Tres Hermanos (Three Brothers) in the background. 14th of January 2016, Carlini Base (Ex Jubany) - Potter Cove, King George Island, in the South Shetland Islands (Argentina - Antarctica). End of day in work in company of an Adélie penguin (Pygoscelis adeliae) with Maxwell bay, icebergs and beautiful cloudy sunset in the background in Carlini base. Taken 8th Feb 2014 in Prydz Bay at Davis Station during the 67th ANARE summer season. A group of Adelie penguins gathered on an ice floe amongst the decaying fast ice in Prydz Bay. 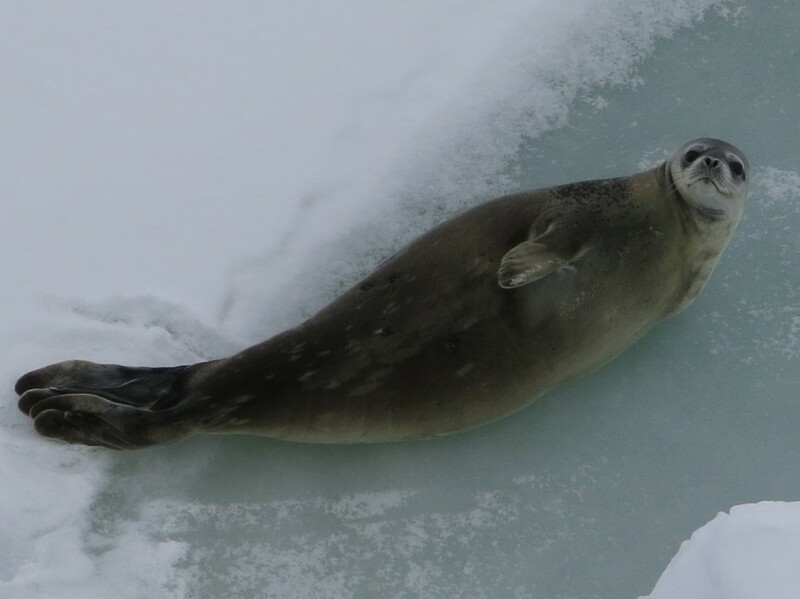 They were keeping a close eye on us as we drifted past their ice floe in an IRB. Picture taken November 2016 in Windmills Islands, Wilkes Land, East Antarctica. 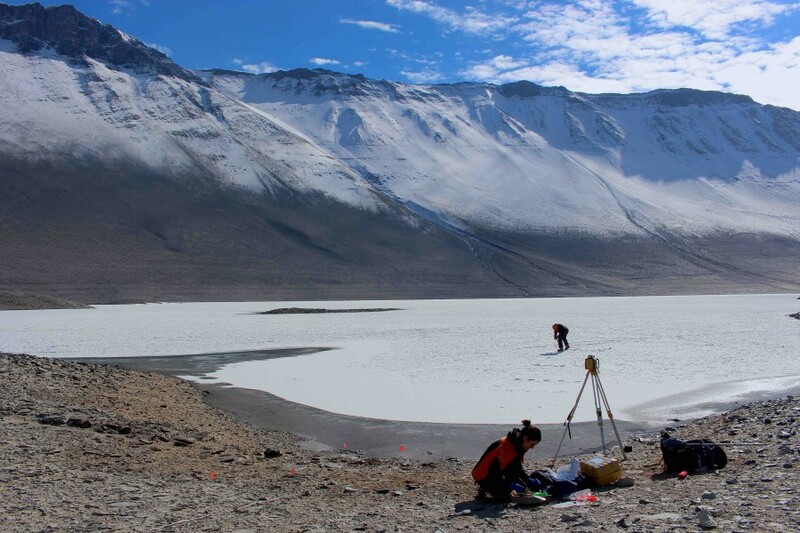 "When drilling for lake sediment cores it really helps to be three: One holding, one pressing and one cheering and taking pictures. " Picture taken December 2016 at Hippo Island, Shackleton Ice Shelf, East Antarctica. 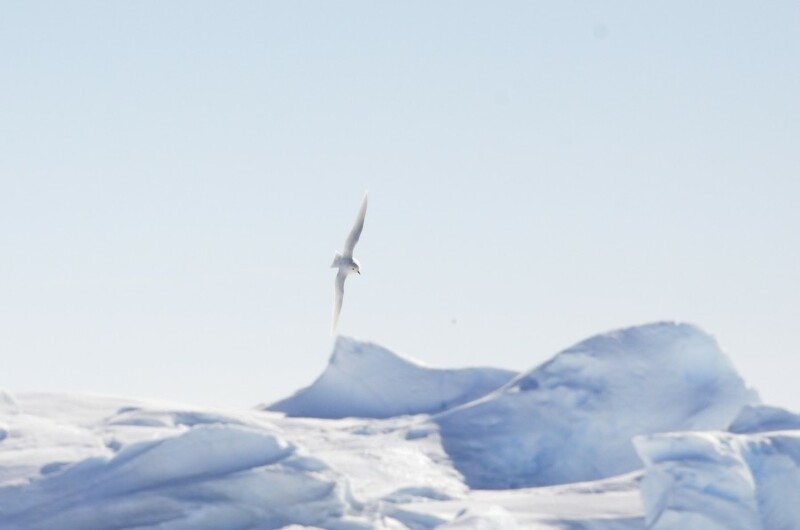 “Snow Petrel (Pagodroma nivea) surfing the ice. 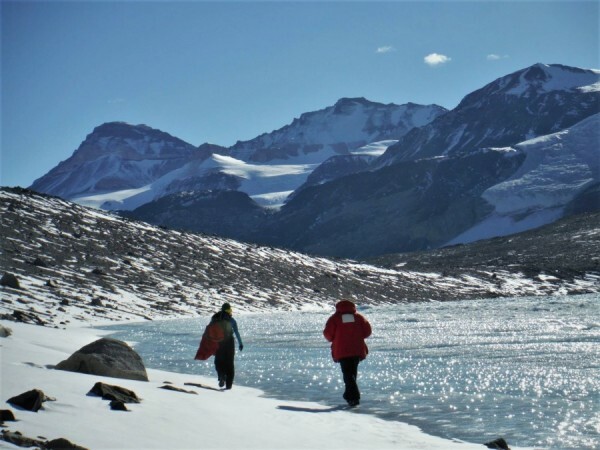 If these guys would keep record of there glaciological observation through centuries, they would be of great help for science. Unfortunately they mostly play around and show off." I took this photo on Wednesday, November 22, 2017 while Carol was atop the tower completing instrument installation on an Automatic Weather Station at Phoenix Airfield. 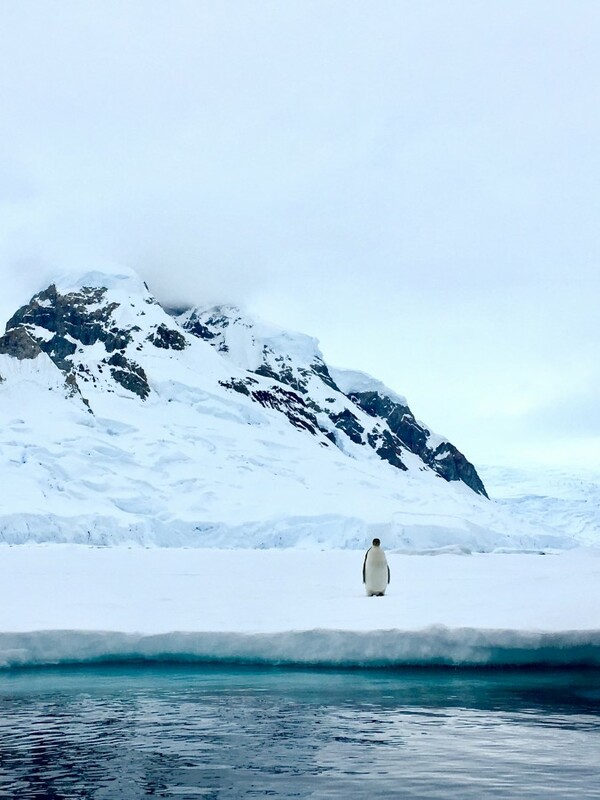 I took this photo in Antarctica near Casey station in December 2016. 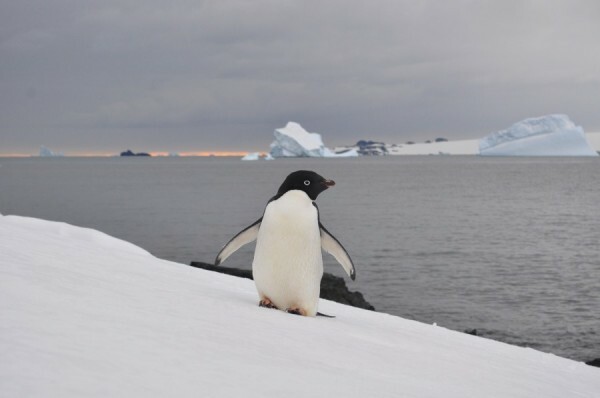 This little penguin is clearly living on the dangerous side of life. 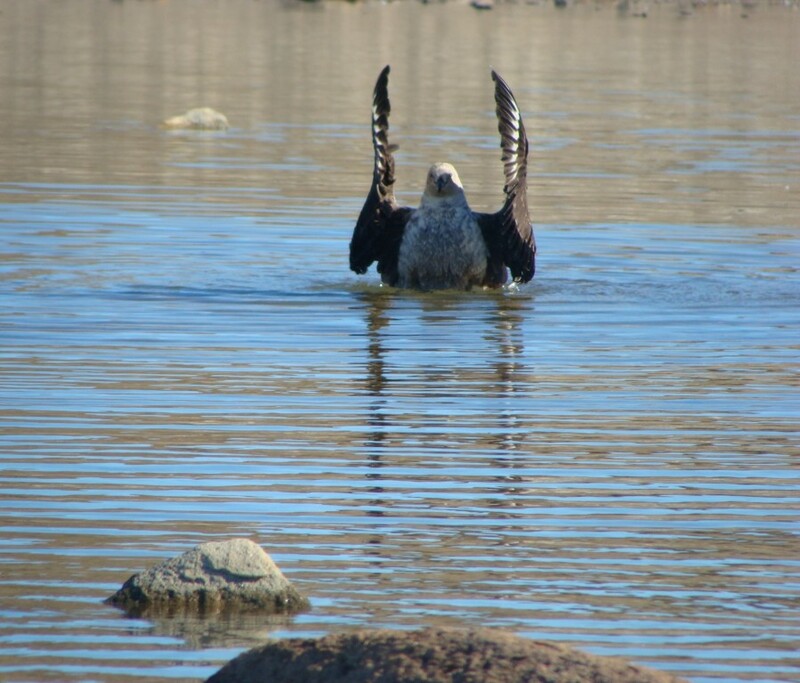 I clicked the picture of this South Polar Skua during my fieldwork in Larsemann Hills.